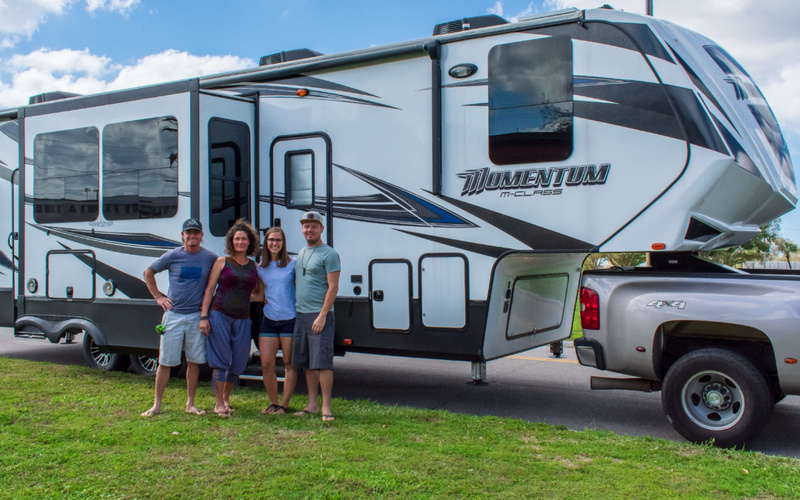 After spending time with family in California, we had to quickly make our way to Idaho Falls for an RV repair. We had an issue with a water leak back in May of 2018. We left Yellowstone and Grand Tetons to get it addressed in Idaho Falls. Unfortunately the RV repair shop didn’t put the underbelly (the skin that protects the insulation and underneath of the trailer) back the right way. As we drove in the rain, we had water get inside the underbelly and need to be replaced again. So that lead us to rushing to Idaho Falls to get our underbelly fixed before the cold came. After racing through Nevada in 2 days, we arrive only to find out the underbelly piece they should have order weeks prior, wasn’t there! Frustrated is a nice way of putting it. 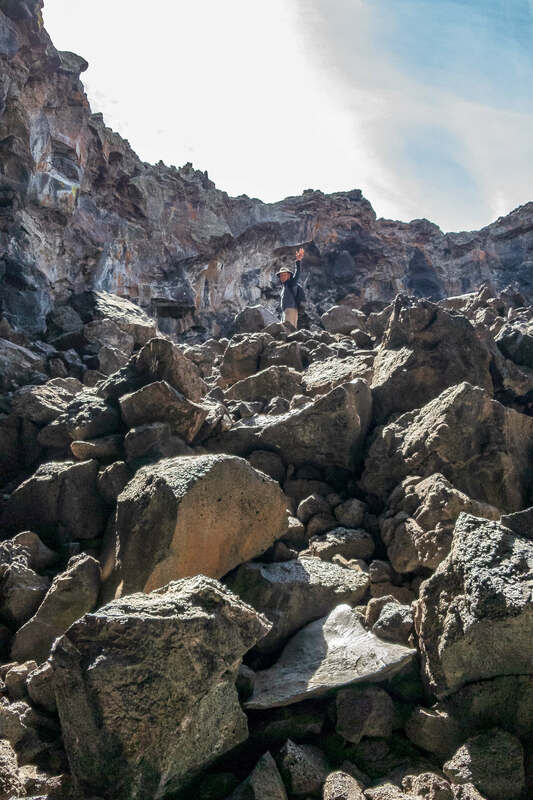 We decided to make the most of this very unfortunate event and visit Craters of the Moon National Monument. 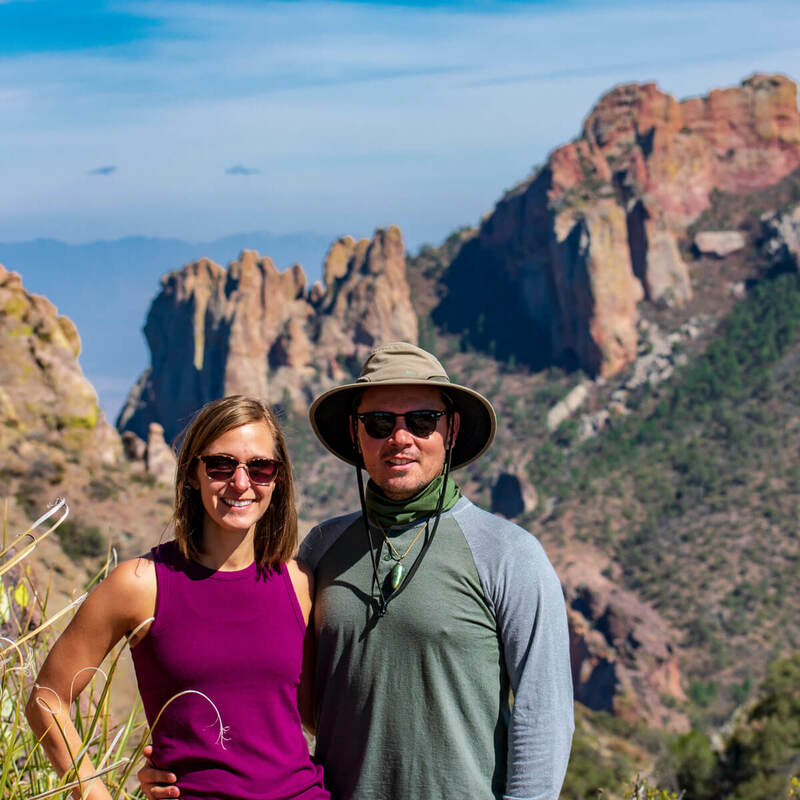 It’s an amazing national monument that easily could be missed if you didn’t know it was there! If your passing through Idaho, make sure to add this to your bucket list! 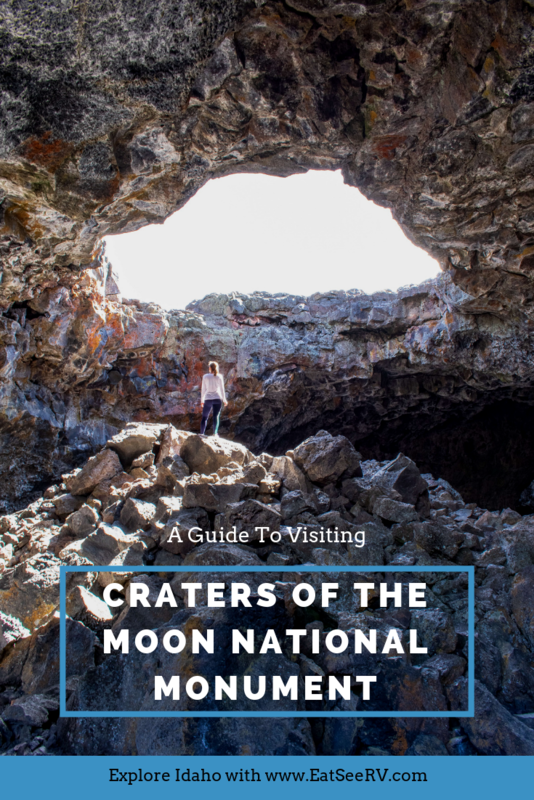 While we’re no experts, we can share our knowledge and experience of visiting Craters of the Moon National Monument. We suggest starting in the visitor center. They have a small museum about how this national monument came to be. There is a great video as well that plays every 30 minutes. After that, take the scenic drive. It’s a small park compared to others, and if you give yourself a full day (I mean early morning to sunset) you can see it all. If your slow like us (or making a vlog), then give yourself two full days. There are 7 stops throughout the scenic drive. 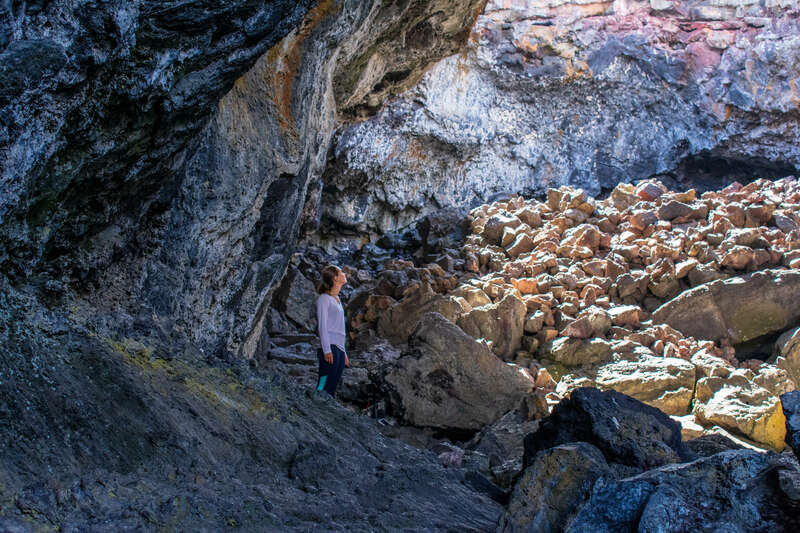 If your short on time and want to know the major spots to hit; we suggest hiking to Inferno Cone (spot 4), Snow Cone (spot 5), Tree Mold Trails and Buffalo Cave (spot 6), and of course Indian Cave, Boy-scout Cave, and Beauty Cave (spot 7). 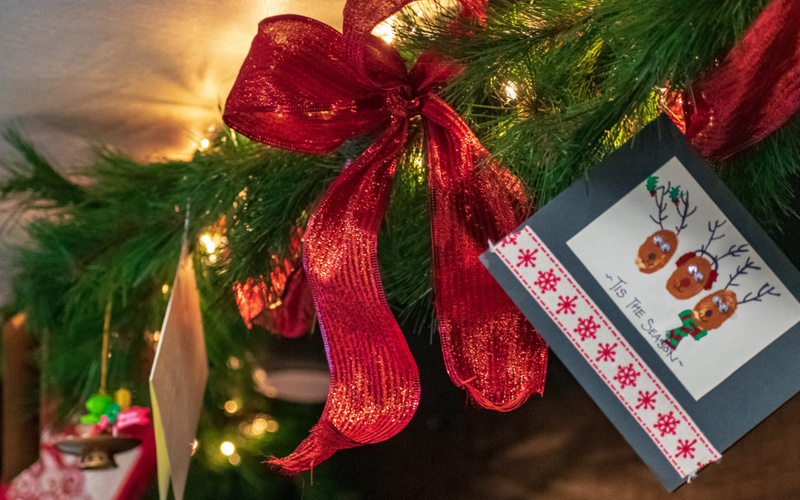 If you want to snag a picture like the ones below, make sure to get a “permit” in the visitor center. They simply ask you if what you are wearing that day has ever been in another cave. They are trying to ensure white nose bat syndrome isn’t spread from cave to cave with your camera gear, shoes, or clothing. If you can honestly answer “no” then you’ll get a fun bat stamp on your hand which means your permitted to enter any of the caves in Craters of the Moon! 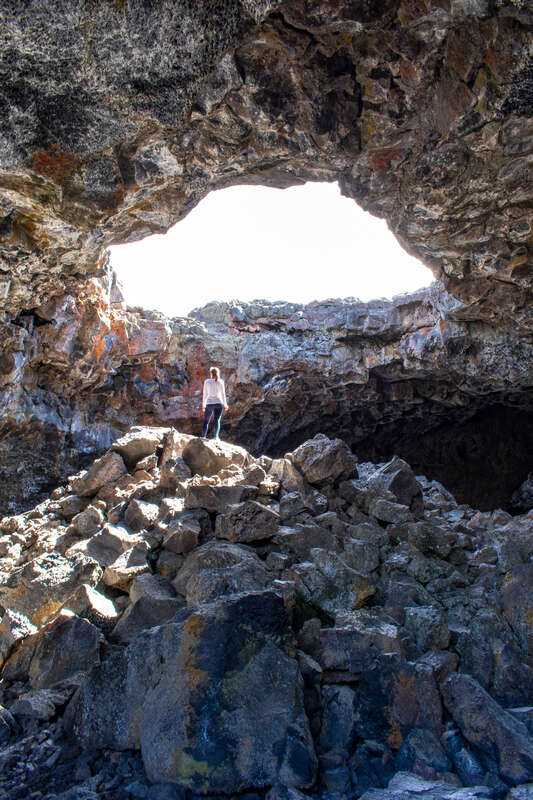 Indian Cave is the largest cave, and you can follow it through from start to finish, walking back on top of the lava fields. It’s a super cool experience and will take you around 30 – 45 minutes if you walk at a normal pace. 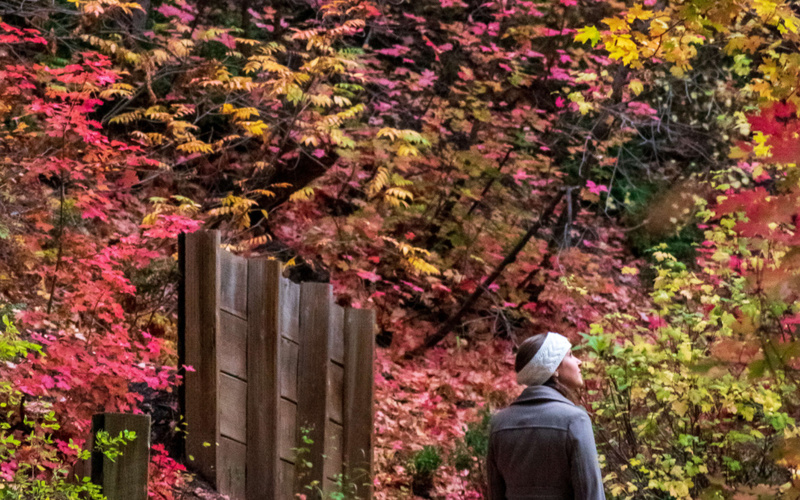 If you’re stopping to enjoy, take pictures, or just go slower give yourself an hour to an hour and a half. 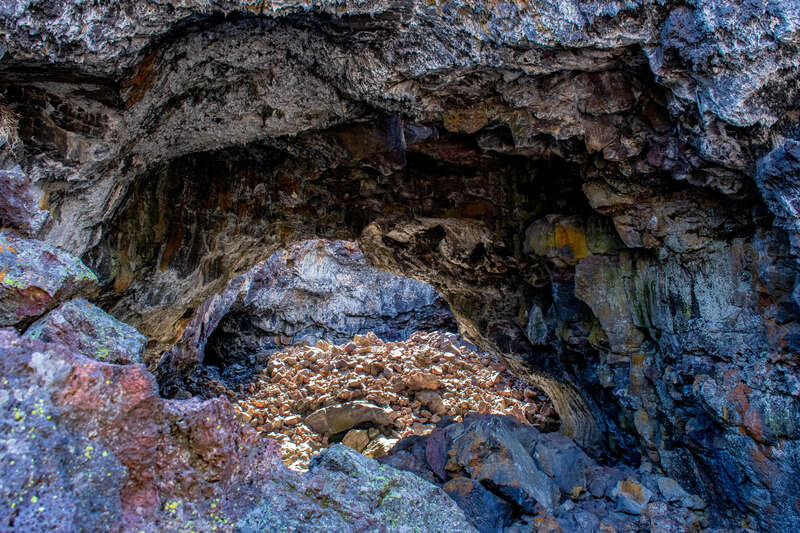 Boy-scout cave is another awesome cave that requires a bit of bravery and preparation. Unlike Indian Cave, it is very dark in this cave. Bring a headlamp or flashlight and make sure you have good footwear. If you come at the right time of year, you should see a decent amount of ice in the back of the cave. 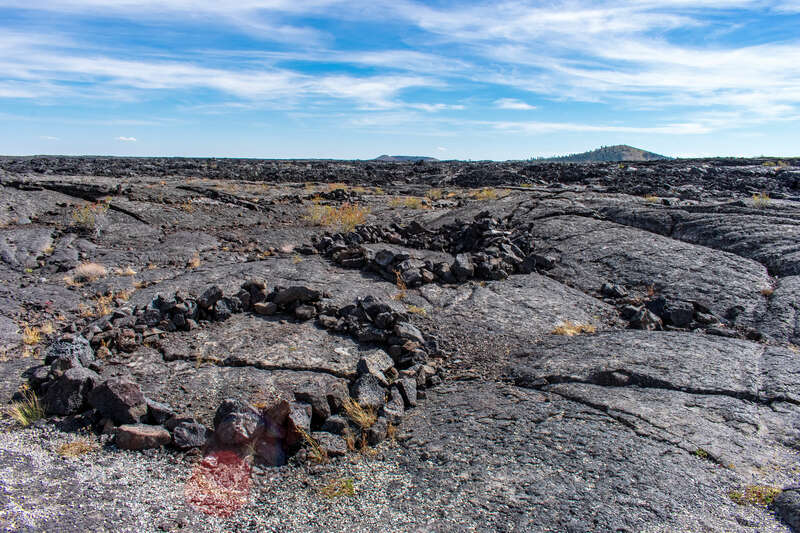 Native Americans used to bring meet here so it would stay preserved all year long as they traveled through Craters of the Moon National Monument on their migration each year. Also look for rock piles formed into a circle. While it’s purpose is unknown, the Shoshone tribe created these circles possibly for wind protection, ceremonial rituals, or possibly as markers for directions on their migration. 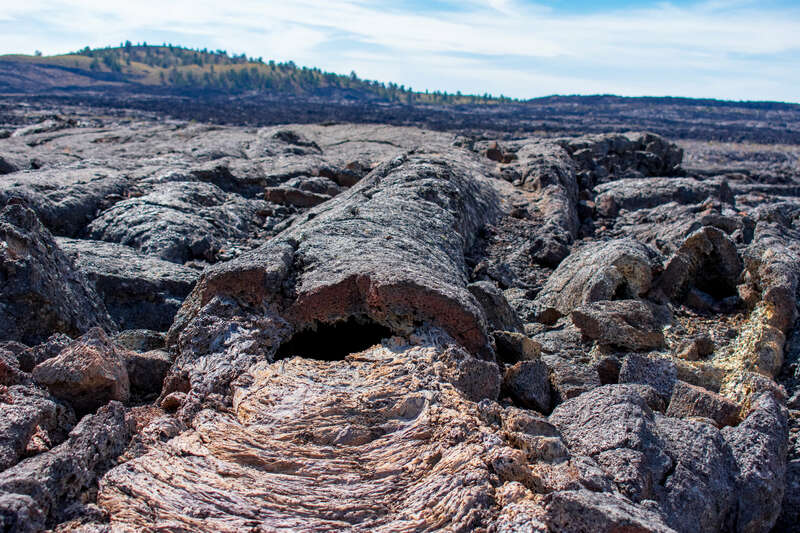 Don’t forget to take note of the various types of lava flow. 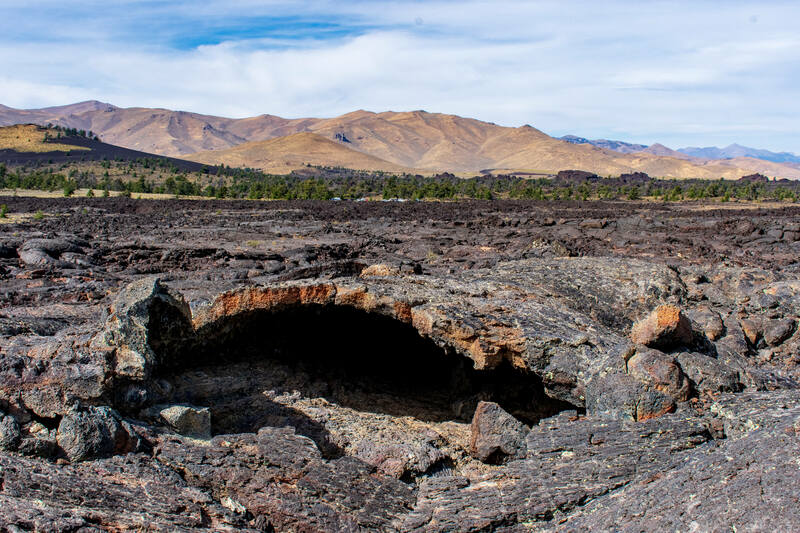 This land has evidence of all different types of eruptions and flows. It’s really cool to compare them all! There are often ranger led tours to the caves or around the park. If you can snag a spot at one of those it’s highly suggested! This has been awarded the dark sky title and they often have full moon tours through the park. We unfortunately missed that during our visit but happily would go back to attend! Imagine walking “on the moon” lit by the moon. Pretty cool to think of, right?! 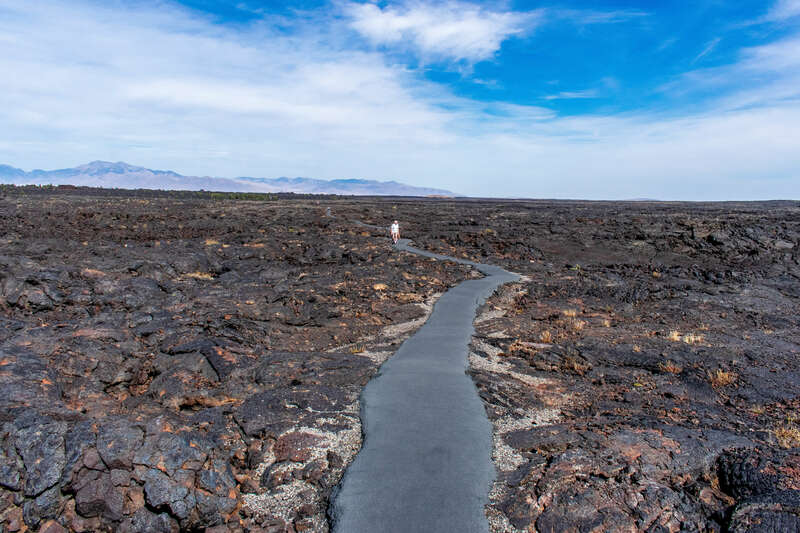 If you have visited Craters of the Moon National Monument we’d love to hear how you liked it, what you did, or your favorite part in the comments below. If you have any questions please don’t hesitate to ask us either! Happy Travels!